The only problem being that these two parties (one of which isn’t a party) are two of the groups coming together to form RISE, so the question didn’t actually make any sense whatsoever. Paul and Lynsey smugly agreed with knowing grins. As does Euan McColm in the Scotsman. I don’t remember anyone in RIC saying any such thing, but I do remember them organising events on a scale that such louche conservative stenographers could only dream about. But the subtext is clear: Scotland doesn’t really exist in any real sense, and the left is dead for ever. McColm is like something from The Land that Time Forgot. He talks about people being in bubbles, but in his world British, European and American politics hasn’t changed a jot, in years. He probably thinks Labour are still in power and Iain Gray, Tony Blair and Jim Murphy are all titans held in huge public esteem. The indrefy was nothing at all and Jeremy Corbyn and Bernie Sanders don’t exist. Scotland hasn’t changed and at midnight the National Anthem comes on. Over at the New Statesman reality bites: “Rumours of the death of the political left have been exaggerated. Corbyn, like Syriza in Greece, Podemos in Spain and the Scottish National Party, is an immune response from a sick and suffering body politic trying to fight off a chronic infection that threatens to swallow hope for ever. There is a crisis in representative democracy in the west and it was established well before the stock-market collapse of 2008” argues columnist Laurie Penny. None of which, presumably, would wash with Smith, Hutcheon and McColm chuckling away on state telly in Jockland where nothing happens. The McColm Principle? Last week McColm wrote of the Scottish Government’s GM ban: “Let’s just, for a moment, say that the research is fair and reasonable and that GM crops do not present a danger to us. Wouldn’t it, in that case, make sense for Scotland to continue to produce them?” Not so much an argument as a mind-exercise. We can all play parlour games. “Let’s just, for a moment, say that Euan McColm is a credible journalist”. Yesterday Germany announced its support for a GM-free food system. . We expect France to follow suit in the next few days – and with it much – if not most of Europe. The McColm Principle is simple, if he argues for it , it’s probably nonsense. The dead certainty of Scotland’s media class is a spectacle in itself. Excellent put down of the Scottish media. Why does a country have to put up with so many intellectual midgets in national newspapers when there is so much talent in Blogland. For one with reading difficulties and without glasses handy the last word looks like Baghdad. Sorry, James. As a bit of a RISE sceptic within the SSP I still welcome that the left is alive and on the move. How can it not be given that it rises from the contradictions of capitalism’s problematic realities. I’ll stop before the Marx quotes begin. Thanks. WE shall see. 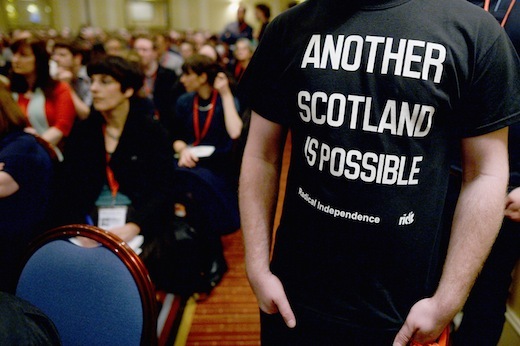 RISE has lots to prove but I have great respect for what the RIC team did for the whole Yes movement. I’m just not prepared to be lectured to by these media luvvies that earn money from believing in nothing. As a RIC footsoldier I say it’s worth a try. Multiplicity of the Left helps nobody. Tommy Sheridan’s prosecutions were too convenient, but that doesn’t make me like his cult of personality thing afterwards. There are lots of ideas on the Left, like the TUSC, but it cannot be at the expense of unity. THEY want us to be disunited, divide and rule has long been the British way. So some effort at a unity grouping is only sensible. To have a neutral group who can act as an honest broker to smooth differences is invaluable. James you are right. But the wealthy own the media in Scotland and it’s run from London. They only employ journalists who agree with their agenda. It’s a sausage factory of disinformation. I go for real news on Wings,Newsnet or here. The MSM stuff is just research to see how the opposition is behaving. That’s right the MSM are the opposition, almost like a political party. Not so much dead certainty as a dead certainty. These people cannot handle that they do not have a monopoly on the ‘truth’ anymore. His other sole ‘skill’ appears to be engaging in general nastiness and spite. A government needs a credible ‘opposition’, to critically review its plans and correct it where it lacks. But criticism can be friendly, and should be constructive. I dislike the idea that Rise are somehow ‘attacking’ the SNP as if we are opponents. We should all be attacking the Unionists. Hmm, sadly there appears to be a lot of that about. Greens have been just as good at screaming, ‘you have to give us your 2nd vote or unionists might get in!’. We can foresee nothing, and so nobody should be carving votes up now and everybody should be voting for the party they believe in most. Then they jeer at you. And if the british had stayed at home building their own infrastructure and not galavanting round the globe seeding strife and division as in India, perhaps Ghandi or a figure like him would not have arisen. The retreat from India overseen by mountbatten was a major cause of the ensuing trouble. You invade a sub continent, rule it by favouring one over another plus repression and then you leave over night, what would you expect? Hence the need for everyone living in Scotland to get behind the SNP prior to our independence from the british. You win when they are wrong………not when you are right…….my grandfather said that 60 years ago. I think with Nick Robinson’s partisan broadside (despite us funding him) the Unionist media are starting to feel besieged and out of control of the situation. That is a good thing. People like McColm should remember that without backing from the MSM nobody would be remotely interested in his delirious gibberish. Bella Caledonia and WOS rose as alternative media to the kind of thoughtless Unionism that people like McColm espouse. I can’t imagine his dull warbles being remotely interesting even if they were Pro-independence. Partisanship is not the issue here but his ineffably tedious journalism is. Give me Cochrane over McColm anyday. Third-rate crap for the fastest declining newspaper in Scotland. As I waken from deep sleep I dreamt of new political party I think it was called RISE, I try to remember and just like all the other dreams it disassapears. The only one I have remembered is the SNP because of all the good work they do for Scotland. Your argument here seems to be: “Scotland doesn’t really exist in any real sense” insofar as people north and south of the border fail to “hold different values, and cherish different ambitions”. But then we have to assume that if Scotland is only real if it’s different from England, then it has some kind of internal homogeneity which overrides any similarities with England – for instance, what if most of the borders is more like England than it is like Dundee? Would Scotland cease to exist? This “real” Scotland needs to be more Scottish than English from top to bottom. Edinburgh and Glasgow can’t really be distinguished at that level, because they’re both just Scotland – but if reality is difference, which of those cities is fake? Is all of Scotland just Edinburgh? And as for McColm’s argument about GM, which is that GM would be a good idea if “the research is fair and reasonable and that GM crops do not present a danger to us” – why is this “nonsense” just because Germany and France might go GM-free? Surely just because Germany and France do something that doesn’t make it right? thanks for commenting. Adam Tomkins blog is called ‘Notes from North Britain’, the name of the hotel at the East End of Princes Street and how Scotland was mapped for a period. WE were bombarded by this message last year and its a constant cultural thrum from those who wish us not to have self-determination. Of course there is continuity and shared interest and similiarity across Britain (and beyond), I wouldn’t doubt that for a second. But there can be similiarity and difference, and there is, some subtle some dramatic, some enduring and some eroding. Scotland doesn’t need to be different to exist, no. Part of the argument that Alex Massie and Euan McColm put forward was that it was ’embarrassing’ for Scotland to have this policy. This sort of relentless inferiorism had us as ‘cranks’ – the suggestion being we were parochial outliers who would be isolated by this stance. I say its nonsense because I know that we are actually part of a mainstream current in European thinking on this and likely to bee joined not just by Germany but by France, Hungary and a dozen other countries. I don’t believe that “the research is fair and reasonable and that GM crops do not present a danger to us” – so France and Germany’s position is – in my opinion – confirmation of the case made by, for example Professor Carlo Leiffert and many others, that food security and yield is not dependent on this technology which is utterly redundant. Thanks for the clarification – rather more understated than yr initial polemic, of course… basically, I’m suspicious of folk accusing Scots journos of denying Scotland’s right to exist, and so on, simply because I think it’s possible to feel Scottish (perhaps Scottish-and-British is the better, albeit clunkier, term) in terms of national identity without thinking there are substantial enough differences of interest between Scots and rUKers to justify outright Scottish nationalism, and I think that’s the usual position of “unionist” or “devolutionist/federalist” people in the press. Amid all the mutual condemnation for Scottish nationalism or British nationalism is there no space to grasp what might be a more fragile and understated (and politically realist) Scottish-British identity which is actively or implicitly non-nationalist? The occasional bit of unwelcome provocation (eg ‘notes from north britain’) is surely replicated by your own side when you claim that these people are somehow ‘anti-Scottish’, etc. Rory, I like your appeal for space for a Scottish-British identity but I think you are at least 12 months too late. (For me the possibility of Scottish-British) identity finally departed on 19/08/2015 with DC’s EVEL announcement). And now in the heat of present moment, we are moving into a fight situation. I regret this….I would guess you do too. But in this fight setting there is now no longer any space for the sane, quietly held ideal of Scottish-British identity but rather we will forced to choose North Britain or Scotland. “I think it’s possible to feel Scottish (perhaps Scottish-and-British is the better, albeit clunkier, term) in terms of national identity without thinking there are substantial enough differences of interest between Scots and rUKers to justify outright Scottish nationalism”. I think you are right that the space for this sane, moderate middle ground view is being squeezed. The squeeze is coming from both sides of the YES/NO question. The squeezing from the YES/nationalist side makes perfect sense, i.e. the SNP etc is only doing what is says on the tin. But the squeeze from the NO/unionist side is perverse because it only pushes us further down the road towards independence. I think that the middle ground you are arguing for will get smaller and smaller until it can no longer bear the weight of your preferred Scottish-British indentity – then what? Poor McColm, he’s pretty toothless now, left to scrabble about in the arse end of the dying Scotsman, penning a weekly polemic that only serves to draw vitriol from those with a working number of brain cells and access to the internet. Long gone are the days when the News of the World bankrolled his petty campaigns of vindictiveness, attacking those who questioned the honesty of the likes of Murphy, Brown, Alexander and the hingers on of the Scottish Labour ‘b’ team. Where can he go after the Hootsman finally folds, is there a safe berth in the communications department of a tame Labour Council that can save him from privation? Ithink that now the euphoria has died down the SNP need to come out with some radical gamechanging policies,especially land reform re-nationalisation of the utilities,Iwould like them to reduce the rent/mortgage burden especially on the young,they have been very quiet of recent worrying? I am not sure that Holyrood even has the powers to nationalise the utilities. If it did then the money would have to be found from elsewhere in the block grant. As far as I can make out, the new responsibilities on the way mean that the block grant is not getting increased to reflect this. In other words, you would have to make serious cuts elsewhere, probably in NHS spending, with all the problems that would cause, to nationalise the utilises. If you demand nationalisation of utilities and the railways then you are going to have to explain where the money is going to come from in the block grant. A bit to complicated for me muttley 79,but we have to step up to the plate if we are ever going to move forward,if we had charge of all of the essentials we could then make it attractive to business and the encouragement of more jobs,maybe a bit simplistic but the capitalist system is working only for the few,people should have better expectations of life it should not be a constant battle just to get through,the population as a whole get thumped for cash at every turn leaving paltry little to go on with,surely someone can come up with a lessened burden of mortgage/rent for starters,look at BT thry are pumping something like £4+BILLION into the EPL where do we come as a country into that equation?bitto the proposed rail link to where Scotland not on you Nellie.We need to be brave and do what is best for Scotland,even if we can,t at the moment the SNP should be bringing out proposals that will catch voters attention. From a position of ignorance about the science the precautionary principle is simply a means to seem reasonable while sitting on constantly moving goalposts. As I pointed out in the original discussion, you and I are both genetically modified, by a mosquito. I found the evidence completely by accident one day in the lab. Because such things are so commonplace in Nature that you can bump into them while looking for something else. Much of the opposition to GM is based on Medieval thinking about inviolate ‘kinds’ that Darwin and Wallace destroyed 150 years ago. This is allied with magical thinking about ‘purity’ of a sort that does not and cannot exist. Note that despite all this Lateral Gene transfer in biology Life has steadfastly not slumped into ‘grey goo’, just one of the utterly ignorant, scaremongering appeals to the precautionary principle. Please tell me precisely and clearly how much evidence, of benefit, of no detriment will convince you? or will you just bleat that absence of evidence is not evidence of absence and that you just ‘know’ you don’t want this ‘stuff’? I’m serious, how far does this precautionary principle go? Does it for eg extend to ‘conventional plant breeding’? This frequently involves plant germ cells in culture being treated with mutagenic agents and/or blasted with levels of radiation. This can and frequently does, lead to chromosome breaking and rearrangement. Yet you seem in your blissful ignorance happy to eat foods bred in that way yet equally from a position of ignorance you object to a technology that makes precise, controlled targeted genetic changes. This biologist is coloured amazed that you can prefer the former over the latter. Conventional plant breeding is like drilling a hole with a shotgun and never mind all those holes you didn’t want. GM drills precise holes of known size and angle. How can you object to unknown effects in GM when they are orders of magnitude greater in conventional techniques? I’m interested to know your thoughts regarding lateral gene transfer. My concerns with GM are largely related to herbicide resistance being transferred to agricultural weeds. (My other main objection is about the technology being used to increase profit margins and revenue streams in the agrochemical industry, which I accept is not an argument against GM, but against those developing particular products over others). However, it must be paid that I have yet to read about GM crops producing consistently higher crop yields over many years, compared to more ‘conventional’ crop yields. It is not all about greater yields directly. Perhaps you missed the GM plants that resist sap sucking insects by making Bt toxin in particular parts of the plant. Note Bt bacteria are routinely sprayed on ‘organic’ crops as a pesticide. So what is wrong with GM plants with making it on for eg their roots to stop the likes of root borer? Such a use reduces the use of pesticides. Many plants make their own pesticides and we make good or bad uses of them. Opium poppies make codeine as a defence against insects and tobacco makes nicotine which acts like a neurotransmitter in animal bodies. It doesn’t make it so that humans will cultivate it, but it made nicotine to protect itself from insects. I’m not enough of a plant biologist to know but it is not beyond possible that such genes originally came from elsewhere by lateral gene transfer. So Bt GM crops are just doing what plants have been doing for themselves for a long time. Bacillus thurinigensis is a common soil bacterium. BTW we have been using the products of GM bacteria and yeasts for decades. Where do you think the enzymes in biological washing powder come from? How do you think the insulin diabetics use is produced? Lots and lots of other modern drugs as well as feedstocks and useful things for industry and research. GM bugs are out there and there has been no outcry. Yet when the technology moves to plants all of a sudden it’s dangerous? well that ship sailed decades ago amongst the protists and Nature and the World has failed to end. More importantly who is funding the stinking cadaver that is the ‘Scottish Press’? It should have expired by now. Maybe the same people who fund the unemployed unionist megaphone McTernan?